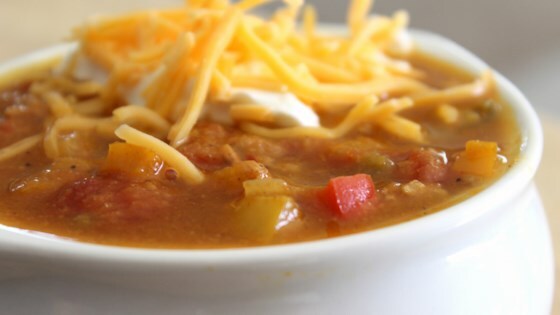 "This is the perfect soup for a chilly evening or a fall afternoon. I have been asked for this recipe over and over again, it's always a crowd pleaser! It's a little spicy, but the sour cream and cheddar balance out the flavors perfectly." Heat olive oil in a large saucepan over medium heat. Saute onion, bell peppers, jalapeno peppers, and garlic until tender, about 10 minutes. Stir in turkey and cook until no longer pink, about 5 minutes. Mix in chicken broth, pumpkin puree, 1 cup Cheddar cheese, tomato sauce, and tomato. Season with chili powder, garlic powder, onion powder, red pepper flakes, salt, pepper, and cumin. Reduce heat to low, cover, and simmer until flavors combine, at least 20 minutes. Serve topped with remaining Cheddar cheese and sour cream. Swap out pasta for healthy spiralized squash! Ground chicken can be used instead of turkey.